Tomato Sauce – a staple in Italian cooking. I never knew how easy it was to make before I met Steph. Maybe it’s the Irish in me but I always just bought expensive jars of sauce at the supermarket. I met Steph in college and she loves pasta (who would’ve guessed) so I soon learned how truly simple it was to make tomato sauce at home. It wasn’t only the simplicity that struck me, it was the flavor. 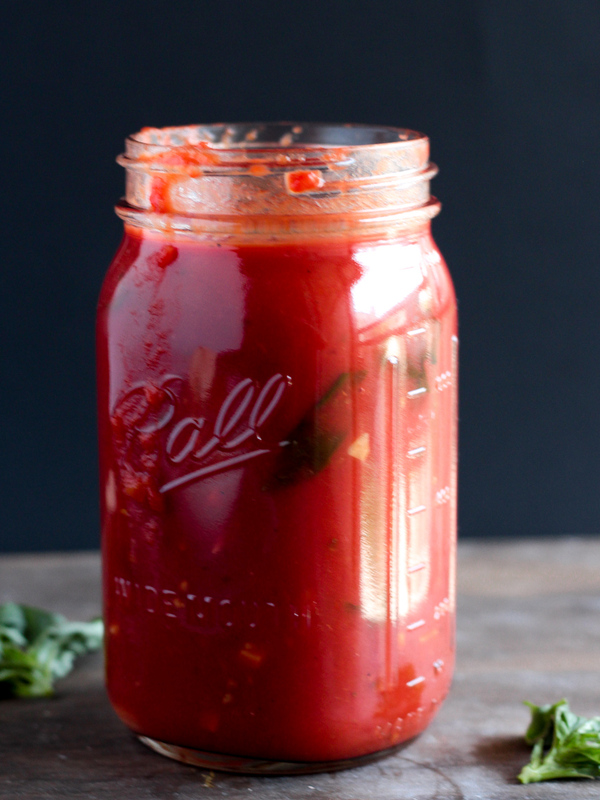 No jar from the grocery store ever tasted as good as the homemade, real deal tomato sauce that is now always stocked in our fridge or freezer (or both). 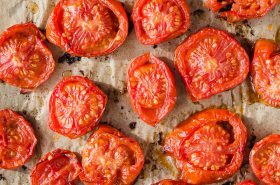 All you need are cans of peeled tomatoes, tomato paste, onion, fresh garlic, fresh basil and a blender. I love this so much because you can buy huge cans of tomatoes for about $3 – $5 each, depending on the brand, origin, or quality. This recipe comes together in just 30 minutes and makes tons to save for when you’ve got that craving again. 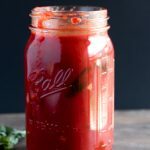 You have absolutely nothing to lose by making homemade sauce, as it tastes great, and you save money in the long run. 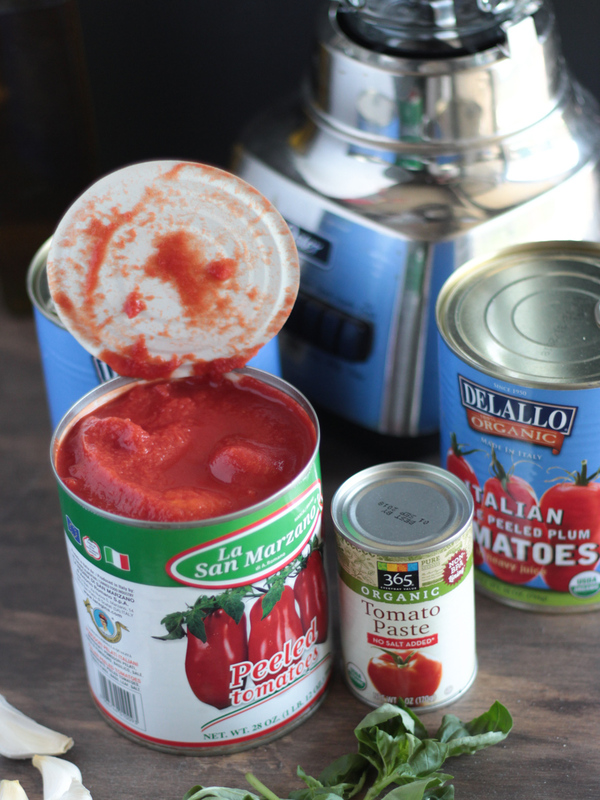 It’s okay to buy a jar in a pinch, but trust me – you won’t go back after making tomato sauce at home. 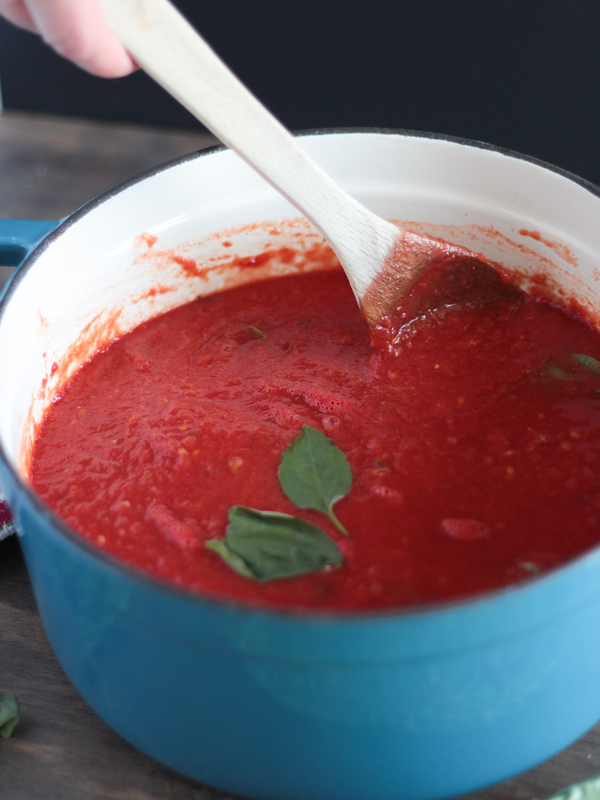 Leave a comment if you make this EASY homemade vegan tomato sauce. 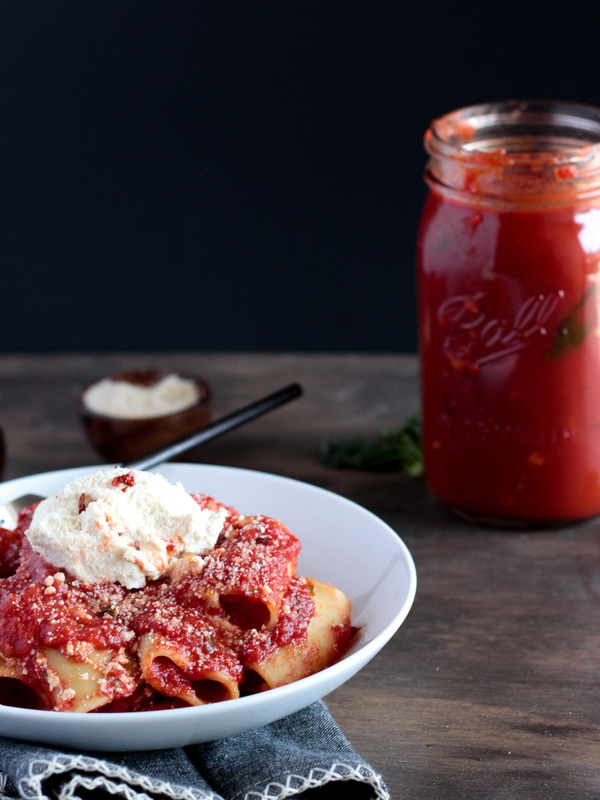 Share a photo of this recipe and use #pastabased on Instagram too. 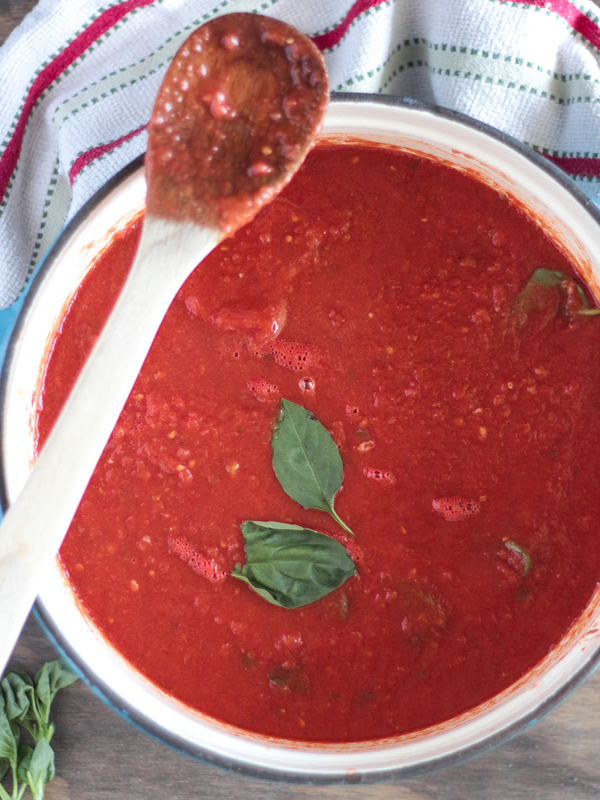 Simple traditional homemade vegan Italian tomato sauce made with 100% plant-based ingredients and ready in 30 minutes. Heat olive oil in a large pot over medium-low heat. Add minced garlic and stir until fragrant (make sure not to burn the garlic). Once the garlic is fragrant, add the puréed tomatoes into the pot and stir. Then, blend the next can and add that to the pot. Lastly, blend the third can and add to pot. Stir. Place half an onion in the pot. There's no need to chop the onion because you'll be removing it later. Stir in tomato paste and fresh basil. Turn heat to low and let simmer for about 25 minutes, stirring occasionally. Discard onion before serving. This recipe makes a lot of sauce (about 8 cups). Store leftovers in the refrigerator or freezer. To freeze sauce, pour into tupperware containers and place it into your freezer. Don't overfill the containers because the sauce will expand once frozen. To use again after freezing, run the tupperware (with the lid on) under warm water, until the sauce releases from the edges. Then, pour the frozen sauce into a pot over medium-low heat, stirring occasionally until defrosted and warmed.